Mid-Life Cruising!!! 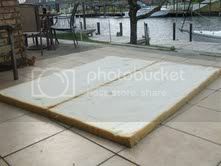 : Foam Mattress for V-Berth! 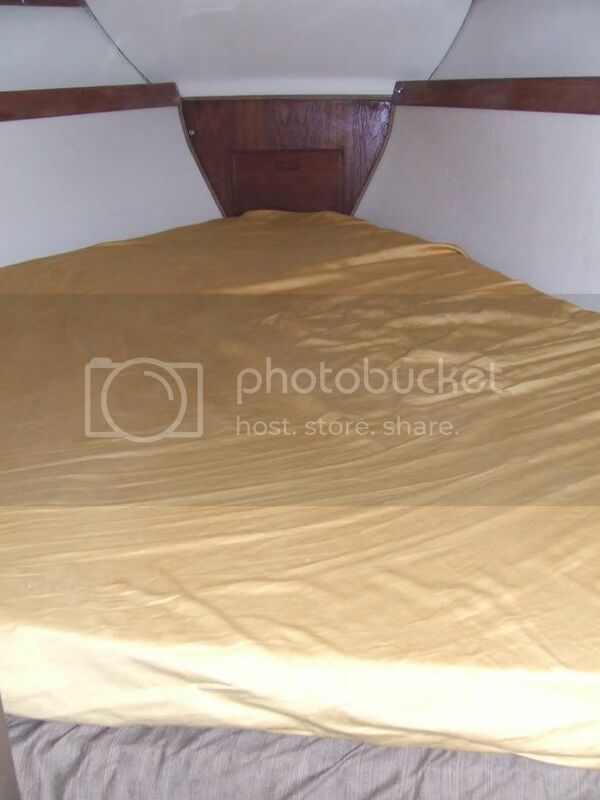 As anyone knows who's slept on a sailboat's original v-berth mattress... they are not comfortable! The few times that Ken and I slept on our sailboat left us sore and not very rested. The mattress felt like concrete, and a good sleep was just about impossible. So, several weeks ago Ken and I went to the local fabric store only to leave empty handed. A 5" piece of foam was $149 ... for a piece of foam! We were left wondering what we could do to get us through this summer in comfort. Then, it occurred to us that quite a few years ago we acquired a piece of foam and had thrown it in the attic - never to be thought of again. We brought the foam down and although it was 5" thick, it wasn't wide enough for our v-berth. Since we're looking for a quick and inexpensive fix to get us through until we're living on our sailboat, we decided to cut the foam in half then tape it together for a larger piece of foam. Ken measured the v-berth, popped some lines on the foam, then started cutting the foam with a large knife. After the cuts were started, it was time to bring out the machete! It cut right through the foam and we had two, 2.5" pieces of foam in minutes. Ken then taped the two pieces of foam together and made the necessary cuts to fit our v-berth (like a triangle). We then folded the foam, positioned it inside our v-berth, taped two pieces of foam to each lower corner to form the triangle shape, covered with an over-sized fitted sheet, and viola ... a new mattress topper for our v-berth! Although we'd prefer a 4-5" piece of foam, this will have to do for now. We were able to try out our new mattress topper during our sail to Mandeville, and we were much more comfortable! If the winds wouldn't have blown us around all night against the dock, we would have had no complaints. We're looking forward to many more nights ahead. $180 at Overstock.com for a queen size 5' piece of memory foam was the best money I ever spent. Good sleeping! Now that sounds like something we'll have to check out when we need something more permanent! The $149 piece of foam we saw was narrow and we would have needed to buy two of them. Thanks for the info! The memory foam is very popular in our boating world too. 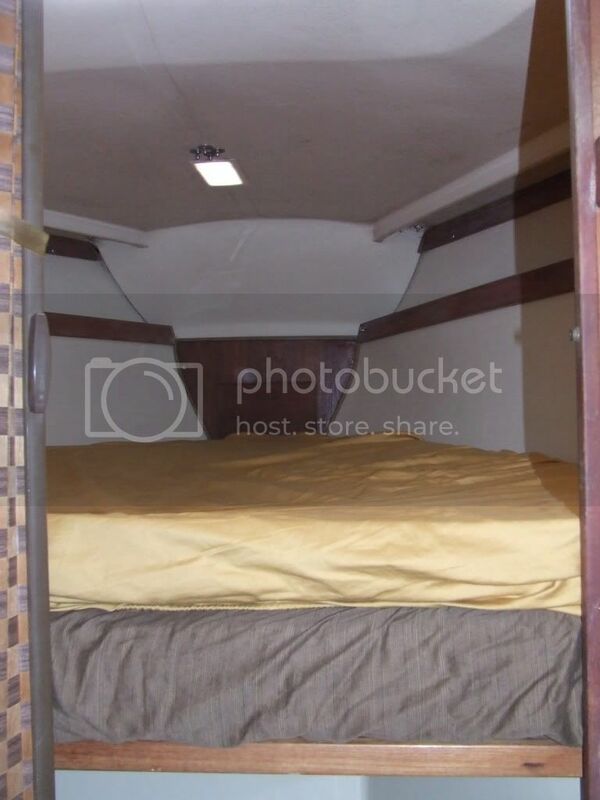 We were lucky to have a great bed right out of the gate so we don't have any trouble getting a great nights sleep in our V-berth. Glad you found a temporary solution. I used a Queen size memory foam topper. cut two pieces going on a diagonal (don't go corner to corner, it should be 1/2 the meassurement of the v end from the corner). Put the two outer edges together to make a center seam and you have the perfect V shape. By the way, an electric bread knife cuts through memory foam very easily.